April 24, 2011 - US Airways filed a federal civil antitrust lawsuit in the Southern District of New York against Sabre Holdings Corp. to halt anticompetitive and anticonsumer practices, as well as recover monetary damages. According to the complaint, Sabre, which is a dominant distributor of airline fares and content to travel agents, has engaged in a pattern of exclusionary conduct to shut out competition, protect its monopoly pricing power, and maintain its technologically-obsolete business model. US Airways contends that Sabre has wielded its significant market power and control through exclusionary commitments from travel agents and other Global Distribution Systems (GDSs), as well as through anticompetitive requirements placed on US Airways and other airlines in order to sell their tickets. Sabre is the largest GDS in the United States and exercises enormous market power over airlines, including US Airways. Over 35 percent of US Airways' revenue is booked through Sabre and Sabre affiliated travel agents. Sabre structures the distribution model so that travel agents, whether they are a traditional travel agency or one of the large online travel agencies that many consumers use directly on the Internet, are typically forced to rely on a single GDS to book airline tickets on behalf of their customers. According to the complaint, Sabre imposes significant economic penalties on travel agents relating to bookings not made using Sabre. If Sabre excluded US Airways from its offerings to its travel agents, those agents could no longer book US Airways tickets through Sabre. 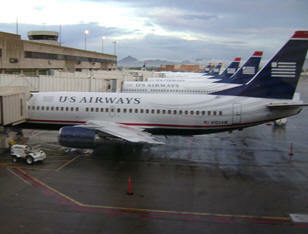 US Airways would not be able to survive the subsequent loss of revenue. Given this disproportionate market control, US Airways is forced to accept Sabre's monopolistic practices. The lawsuit follows after the recent execution of a new distribution agreement between Sabre and US Airways, which was reached in late February 2011. During negotiations with Sabre, US Airways made it clear to Sabre that it sought a new contract without exclusionary restrictions that protect Sabre from competition. However, Sabre threatened to shut off access to US Airways if the new agreement did not include these anticompetitive restrictions. According to the complaint, US Airways was forced to acquiesce to Sabre's "my way or the highway" demands as a part of any new deal. The complaint also alleges that Sabre has been aggressive in suppressing the ability of travel agents to book tickets directly with airlines using so-called "direct connections." US Airways pays Sabre so that Sabre affiliated travel agents can book tickets on US Airways. Across the board there have been advances in technology and communications, and a corresponding decline in those costs, yet the cost of doing business with Sabre remains artificially inflated. "The airline industry and other technology services providers have become more efficient, yet Sabre's conduct has enabled it to charge inflated prices with outdated technology that was developed before the Internet existed. Lower-cost, more technologically-advanced alternatives and innovative fare products are being shut out by Sabre's actions," said US Airways President Scott Kirby. "US Airways wants to be able to widely distribute its products and services to consumers in a cost-effective and efficient way, but Sabre continues to erect roadblocks to this goal. US Airways and travelers would see enormous benefits if Sabre had to compete on a level playing field," said Kirby. Both the Antitrust Division of the United States Department of Justice and the United States Department of Transportation have, in the past, recognized that Sabre exercises significant market power over airlines like US Airways.